Before football there was archery! Yes guys this was once our national sport until someone thought of inflating a pig’s bladder and chasing it around a field. Archery remains a popular activity in the UK and at our Liverpool activity centre you will get the chance to try out this ancient sport and see if you'd have been much help at the battle of Agincourt! Your qualified instructors will hand you a powerful recoil bow and show you how to hold, aim and fire your arrows. You'll need a steady hand and a keen eye if you're going to hit the bullseye, so there could be a few arrows going astray if your on the back end of a late night! 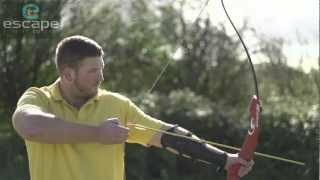 View our Archery video and get an idea of what to expect on this activity.